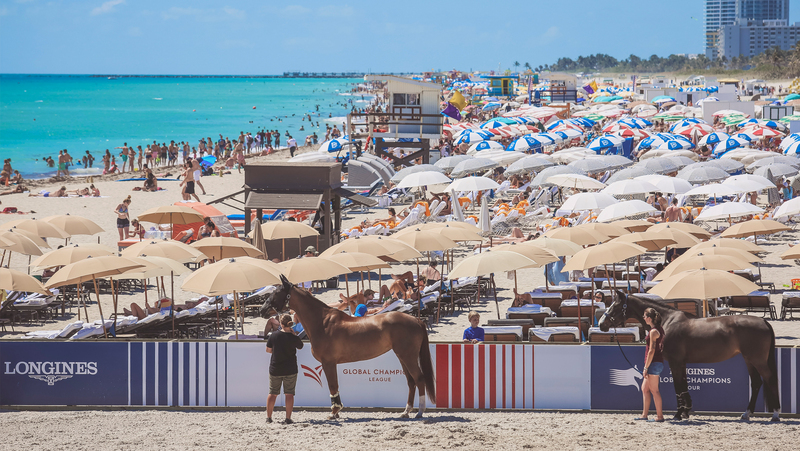 Giants of showjumping converge on the iconic Miami Beach in South Florida this week for the much-anticipated second leg of the 2018 Longines Global Champions Tour. The 90x40-metre ring is just a stone’s throw from the crystal blue Atlantic ocean — but don’t be fooled; it is not run-of-the-mill beach sand that these world class horses will be jumping on: it is tons of imported, high-tech arena surface carefully laid for the purpose enabling some of the sport’s best horses to perform at their breath-taking peak. A stellar line-up of 64 athletes contest the five-star classes, including European champions, Olympic gold medallists and previous Miami Beach victors. Great Britain’s Scott Brash hopes to extend his sizzling form under the Florida sun, having won the Grand Prix in the opening 2018 leg at LGCT Mexico City last week. His mare Ursula XII carried him to victory in the vast grass arena in Central America, but can the 17-year-old mare by the great jumping sire Ahorn help him repeat the feat this week? The ring in Miami Beach is very different, but Brash brings the experience gleaned in 2015, where he won this leg on the legendary Sanctos. Ursula and the other horses, who are stabled in Collins Park, off Miami Beach’s world-famous Collins Avenue, just feet from the beach, have all had a spin around the main arena this morning — with many riders opting to come to come out at dawn. The 24-year-old Belgian twins Olivier and Nicola Philippaerts are among the illustrious names bidding for glory. Second in the Miami Beach leg last year, Nicola’s Casall gelding stallion H&M Chilli Willi is now 10 — an optimal age — so could be well poised. But don’t discount his other ride, H&M Harley vd Bisschop, as this grey gelding is more than capable; proved by the five-star Grand Prix wins on his impressive CV. Another with a strong form-book is the Irish rider Bertram Allen who scooped a second place finish in Mexico City on Gin Chin van het Lindenhof, who he has brought to Miami Beach. Italian challenger Lorenzo de Luca brings two exciting horses; Halifax van het Kluizebos and Limestone Grey, who helped make him one of only two riders to jump double clears at the season opener in Mexico City. No stranger to this breathtaking venue, Jérome Guery was a winner here last year with Grand Cru Van De Rosenberg, who has moved stables, but this year campaigns the talented 12-year-old Quasimodo Z son Garfield de Tiji des Templiers. The LGCT Miami Beach runs from Thursday 5 April to Saturday 7 April and spectator entry is free for the duration of the event. Due to its popularity, capacity for this year’s show has also been increased. Home fans will have ample reason to cheer, with top American riders in action including Laura Kraut, Jessica Springsteen, Margie Goldstein-Engle, Beezie Madden, Jennifer Gates, Georgina Bloomberg and Lauren Hough. Other big names to watch in the star-studded field include the German riders Christian Ahlmann and Marcus Ehning, British Olympians Ben Maher and Michael Whitaker, the Frenchmen Simon Delestre and Roger-Yves Bost and the Netherlands’ Gerco Schroder, whose stallion Glock’s London makes a welcome return to competition this season after a break from the sport. And if you can’t make it to the venue in person, every five-star class is being live-streamed online at https://www.globalchampionstour.com/gct-live/ so you won’t miss a second. As well as the €300,000 LGCT Grand Prix, riders are also fighting for a golden ticket to the GC Prague Play-Offs, where each individual winner will earn a place in the Longines Global Champions Super Grand Prix — the ultimate face-off in December where the season’s winning riders battle for the €1.25 million prize-pot.